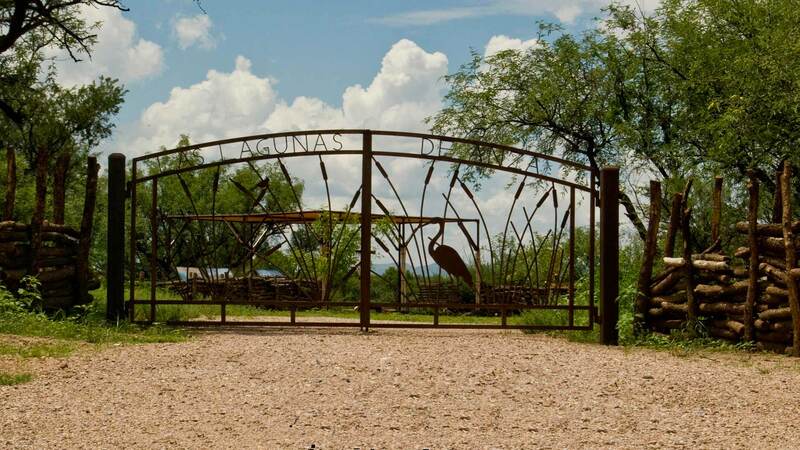 The trails and other amenities at Las Lagunas are the work of more than 200 volunteers who, over the past seven years, have come together to create an extraordinary place. Without the kids from scouts, the NHS Science club, Nogales Clean and Beautiful, the Johnson Family and so many, many more, these wetlands would still be nothing more than a dump! The beauty and care of this pristine park is a community affair, by us and for us, all of us! Sedgwick Trail: To the east of the parking area is a loop trail which winds around the perimeter of the natural desert grassland through marshy areas and mesquite groves. Named for the family who share this land with the Nogales and Rio Rico communities, especially the children, that they might learn about and enjoy the wonders of water in the desert in the midst of their city. Sedgwick Trail highlights the traditional high desert habitat although it is only steps away from the marsh. 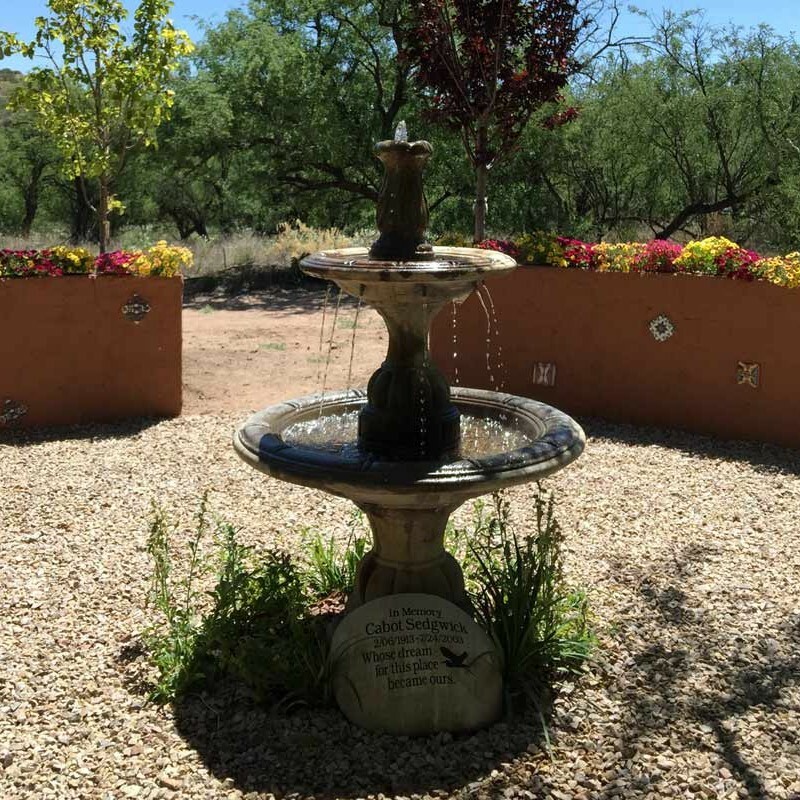 The Cabot Sedgwick Memorial Butterfly Garden beckons the visitor to rest or meditate under the canopy of mesquite trees surrounded by the peace and beauty of nature. Butterflies,birds and flowers of all kinds abound in this quiet oasis. Willow Trail: Named for the desert willow that grows wild along the riparian bank, this trail passes under the carved trailhead on the upper bench then heads down to the marsh, turns south past the bird blind and loops back up to the outdoor classroom and picnic area. From this trail, a full panoramic view of the wetlands can be observed. The trailhead entrance sign was designed and hand carved by volunteers Chet and Ruth Johnson. 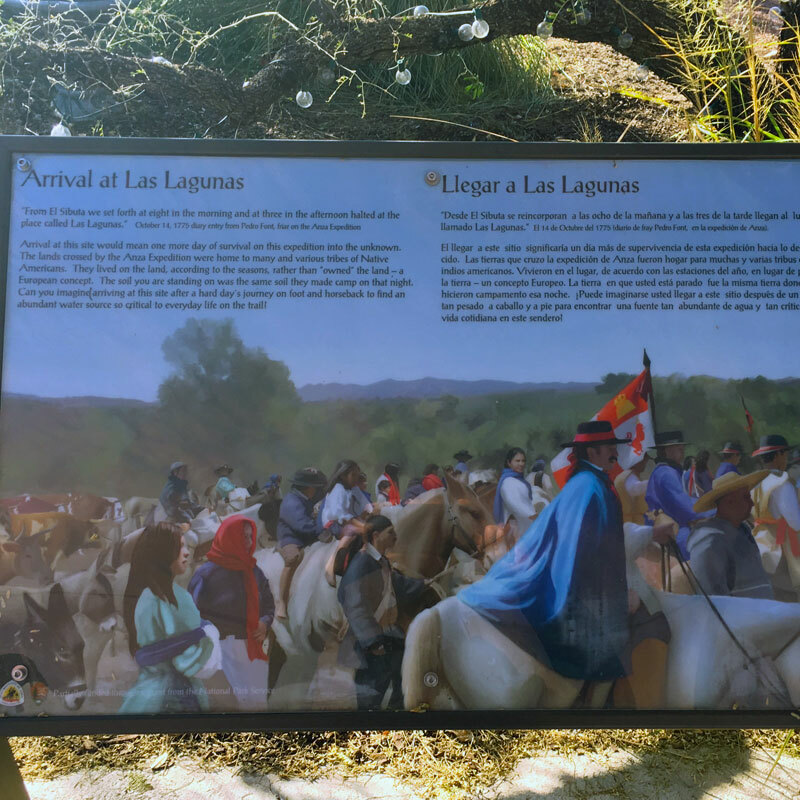 Note the interpretative sign at the trailhead where visitors can view the various birds, wildlife and habitat of Las Lagunas. This sign is special for the community as the artwork was done by students from Nogales High School. 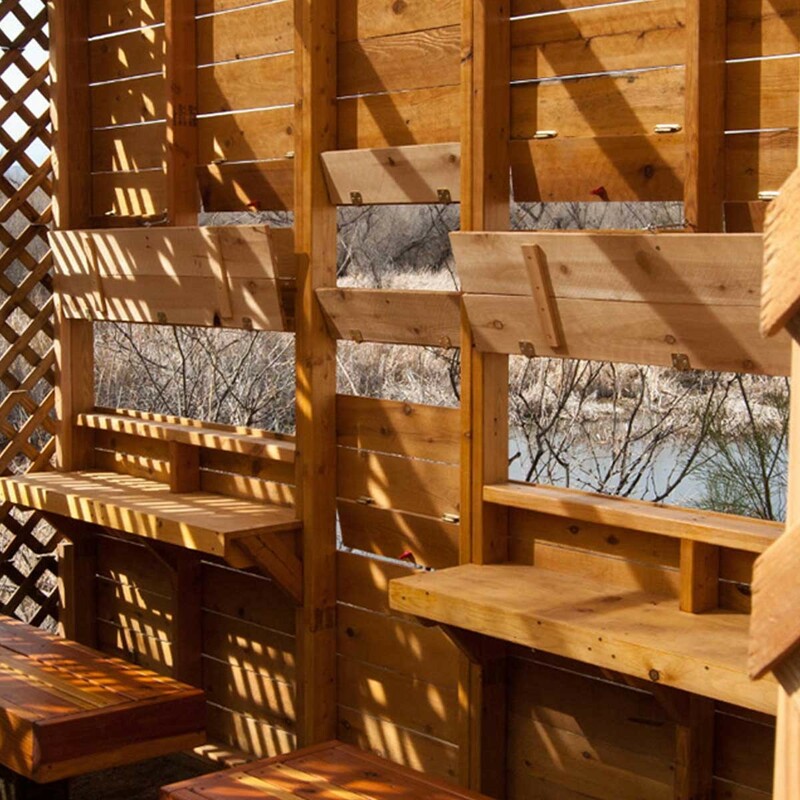 The wood bird blind on this trail was designed and built by Don Clemans and his son Allan. Its unique structure allows visitors of all ages to sit quietly and view wildlife. For best viewing, come early in the morning or dusk to see all manner of wildlife and waterfowl enjoying the wetlands. 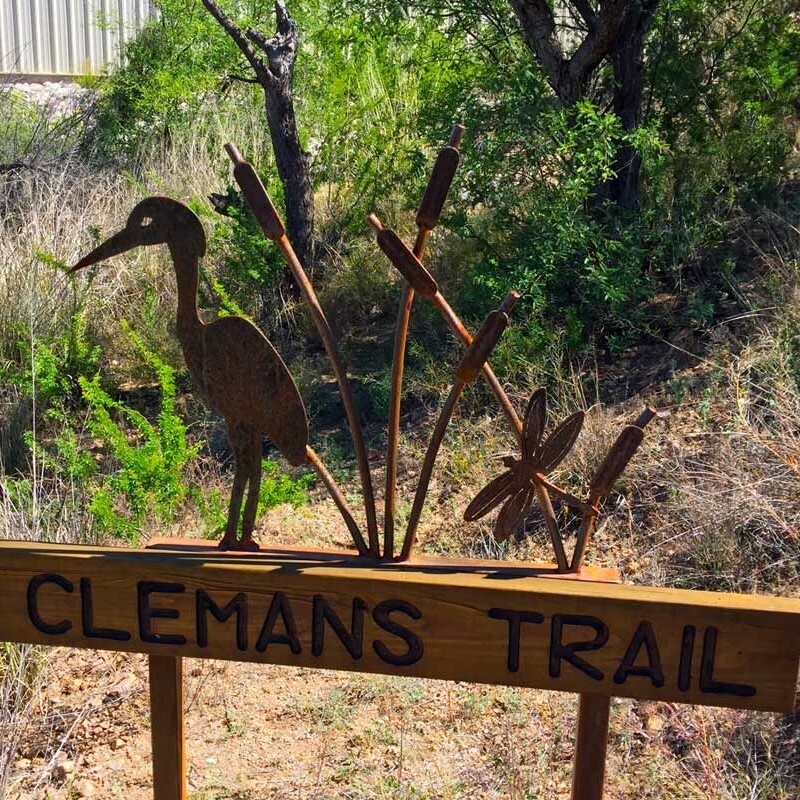 Clemans Trail: This trail named for our lead volunteer Don Clemans who has dedicated more than seven years of his life to Las Lagunas branches off from Willow Trail and passes across a 75’ boardwalk designed and built by Don with the help of volunteer Chet Johnson. As you walk the narrow passages through the tall cane (Arundo Donax) the sites and sounds of the city disappear and you are in nature. Note the small Virgencita altar, a gift of the men from the Santa Cruz Training Program. The path opens up to a ramp and a floating dock; Duck Landing, where young and old alike can touch the water and see the amazing life that thrives in this place. The floating dock, the benches and so much more were the work of many volunteers, a special mention for Jorge Hernandez who completed his Eagle Scout ranking by building the dock and area benches with Don’s guidance. Don Clemans has been our lead volunteer for seven years beginning with his involvement with the initial project team; planning, designing, researching and finally “boots on the ground” restoration and enhancement of Las Lagunas de Anza Wetlands. Most of the photos in this website were taken by Don as well. 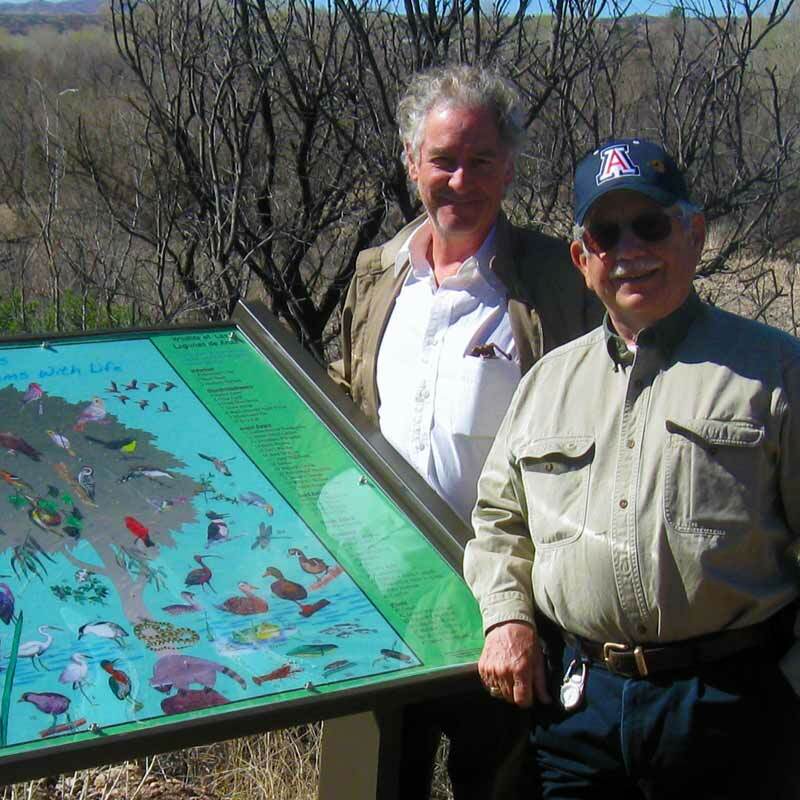 Don earned the Presidential Volunteer Award for the work that he has contributed at Las Lagunas and was also recognized by the National Park Service. 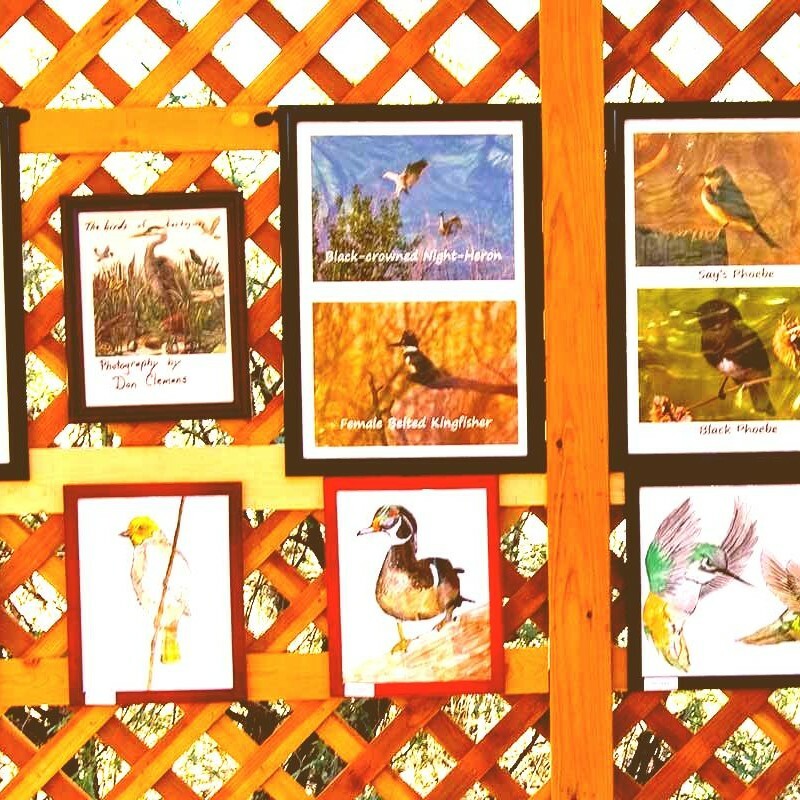 His contribution, passion, and commitment to this wetland has benefitted the wildlife, the public and the children who come to Las Lagunas de Anza. 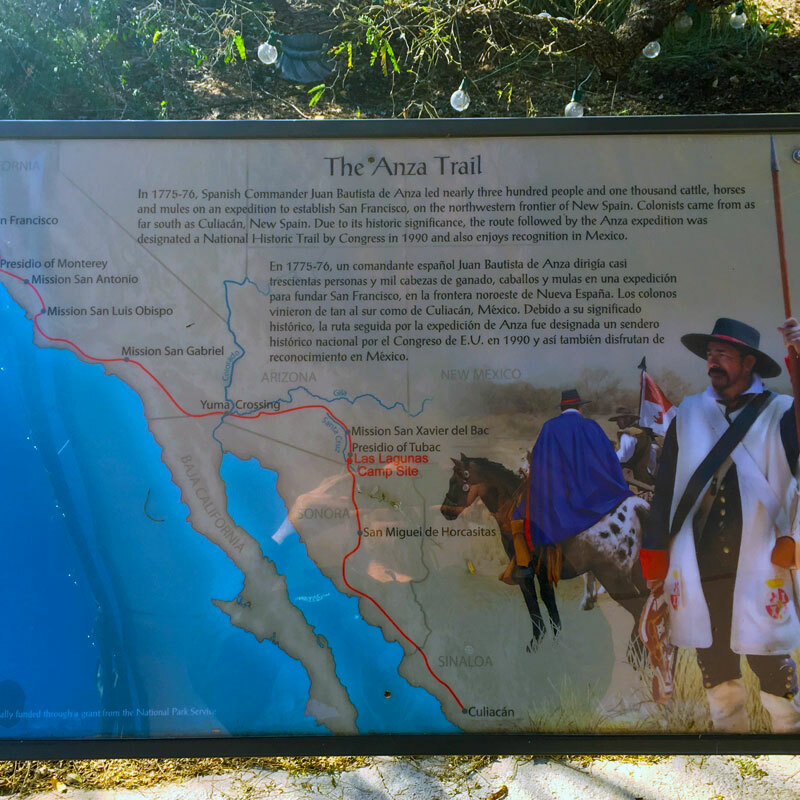 Entrance Ramada: Three interpretive signs made possible by the National Park Service tell the story of the Anza Expedition. 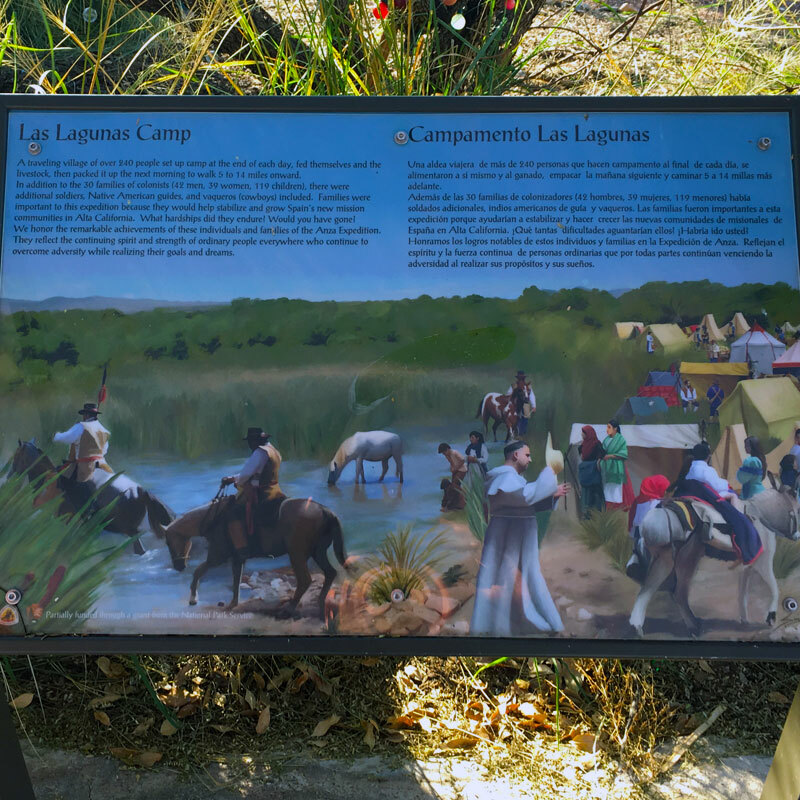 These are a map of the trail, a representation of the expedition arriving at Campsite #13 (Las Lagunas de Anza) and a third panel which depicts what the wetlands looked like when the colonizers made camp here. In this ramada, guests can register and find self-guided tour pamphlets as well as Junior Ranger programs and other useful information about the site. La Galeria: A beautiful wood ramada with seating around the perimeter, this shady place is where we display art and photography, have receptions, small talks, meetings and more. The view from the Galeria provides an overview of the marsh as an integral part of the surrounding aquifer. The Spanish word galeria means gallery. 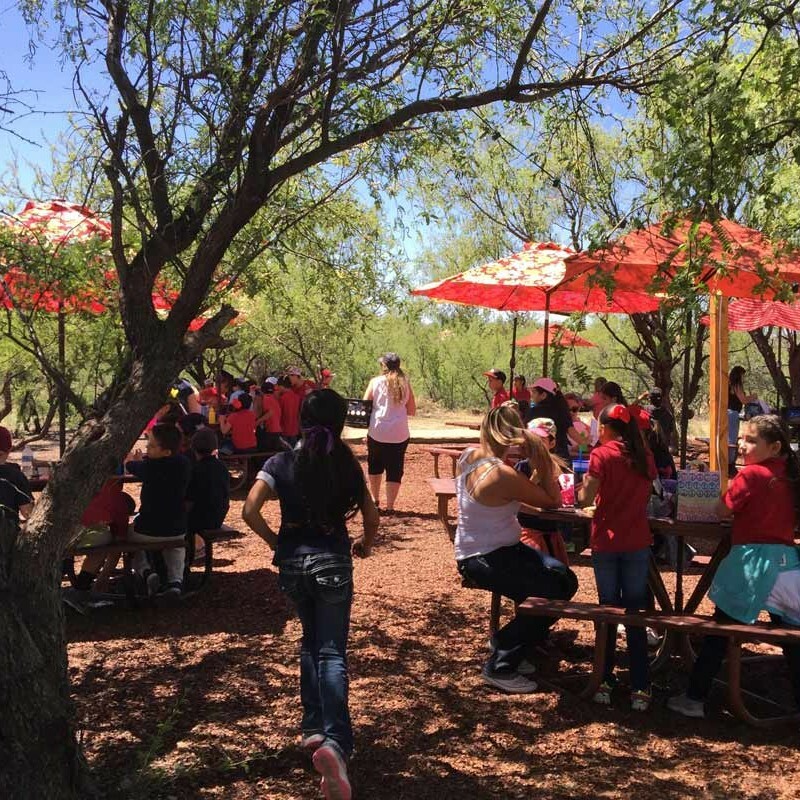 Mesquite Grove: The outdoor classroom and picnic area on the upper bench boasts numerous picnic tables shaded by mesquite trees. Pecan shells underfoot attract birds and add to the beauty of the grove. This is an ideal spot for picnics, outdoor science, history and nature classes, events and presentations. Local school children enjoy their lunch here after a morning of hiking, birding, and fun at Las Lagunas de Anza. The Mesquite Grove has been host to many events over the years and future plans include a permanent stage. 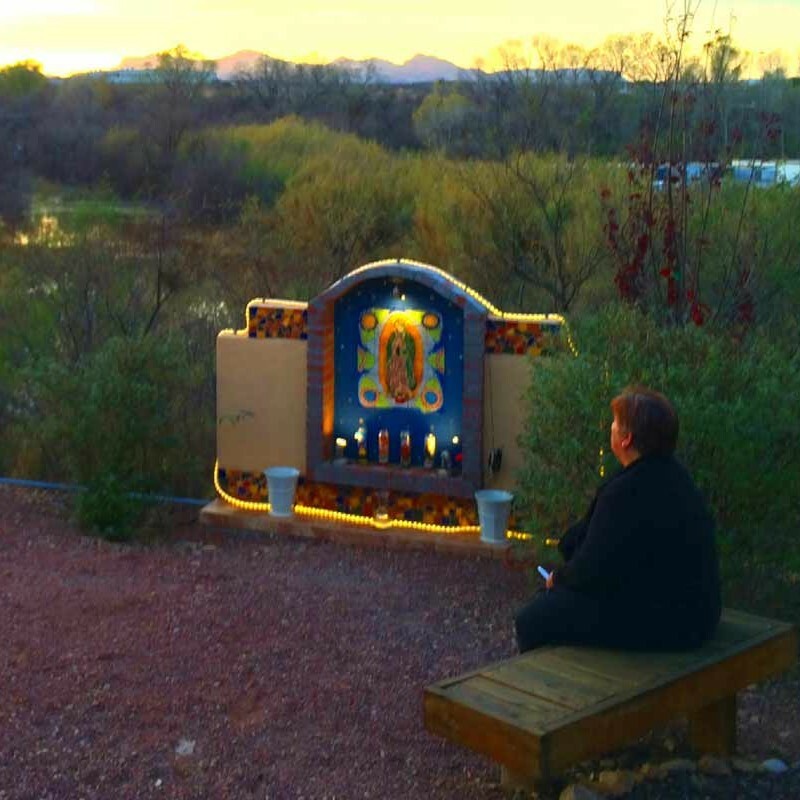 Virgin de Guadalupe Shrine: Designed and constructed by Santa Fe Ranch staff, volunteers and students from Lourdes Catholic Academy, this beautiful shrine welcomes visitors and watches over Las Lagunas. Her candles burn brightly during events and flowers are offered by the community when a special gathering occurs at Las Lagunas. The Virgin de Guadalupe was the patron saint of the Anza Expedition and is also the patron saint of our neighbor; Mexico. She brings a sense of beauty, peace and contentment to this site. Behind the shrine, a box for the National Park Service Passport Program is found. 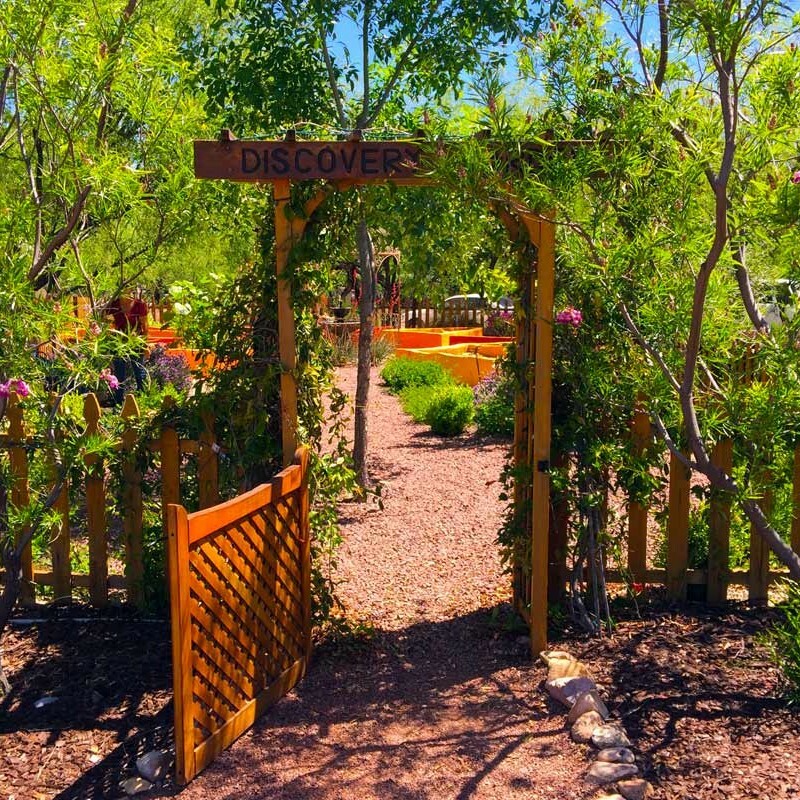 Discovery Garden: In this garden designed by Arlyn Johnson and constructed by staff, volunteers, and members of the Anza Ambassador Club, “sun rays” of heritage plants encircle a Spanish archway and fountain. This garden honors the peoples who came before and the crops they may have grown or the food they may have eaten. We plant heritage seeds from Native Seed Search whose ancestors are hundreds of years old. These have included White Sonoran Wheat, Taos Blue Corn, Tohono O’odham Corn, Hopi Rattle Goards, Navajo Cushaw Squash, Hopi Black Dye Sunflowers , Mirasol and Patonia Chiles and Hopi Black Pintos. An iron bench; a gift from Senor Gloria who lives on site offers a place to sit in the shade of trees. In November, we have an annual farm-to-table event; The Harvest Dinner prepared from the bounty of the garden. Friends and community members enjoy a 5-course dinner under the stars served by the Anza Youth Ambassadors and prepared by Santa Fe Ranch Foundation staff on site.